LINFEN, Shanix, China, Jan. 10, 2018 /Christian Newswire/ -- An explosion rang through the air early yesterday as authorities bombed and demolished a serially persecuted church in China's northern Shanxi province. Golden Lampstand Church in Linfen, Shanxi was once a 17 million Yuan ($2,603,380.00 USD) unregistered church, paid for completely by the Christians who attended it. 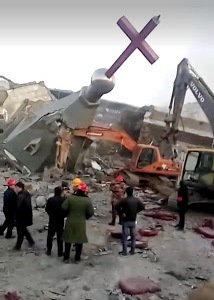 On Jan. 9, Chinese military police detonated explosives situated in underground worship halls beneath the church and proceeded to demolish its above-ground building, leaving it shattered. China's military police has been under the direct control of the central government since the head of the public security bureau, which previously commanded it, was arrested last year. This indicates that the order to destroy the church came from China's top officials instead of the less-powerful local authorities. This is not the first time the church has faced persecution, however. China repeatedly cracks down on house churches, which are churches that refuse to register, often to opt out of government monitoring. Officials often prosecute such choices, however, and some of Golden Lampstand Church's leaders have been imprisoned for one to seven years, simply for serving at their church. "The repeated persecution of Golden Lampstand Church demonstrates that the Chinese government has no respect for religious freedom or human rights," ChinaAid President and Founder Bob Fu said. "ChinaAid calls on the international community to openly condemn the bombing of this church building and urge the Chinese government to fairly compensate the Christians who paid for it and immediately cease these alarming demolitions of churches." As the church was being built on Sept. 13, 2009, church members who slept at the construction site were awakened by 400 officials and beaten as the building was razed. 30 of them reached critical condition. When Yang "Esther" Xue, the daughter of two of the church's pastors, learned of the beatings, she phoned home, but no one answered. Later, she learned that both of her parents had been arrested on Oct. 11, 2009, as punishment against house church leaders. Yang Xuan, her father, spent three-and-a-half years in prison, and her aunt, Yang Rongli, spent seven years incarcerated and received a 30,000 Yuan ($4,594.00 USD) fine. Her mother, Yang Caizhen was sentenced to two years in a re-education labor camp and beaten while incarcerated, while her uncle, Wang Xiaoguang, received a three-year jail term and fined 10,000 Yuan ($1,531.00 USD). Yang Rongli, who has been under government surveillance since her release in 2016, described the demolition to a ChinaAid reporter, saying, "...the police surrounded the Golden Lampstand Church. Patrol wagons guarded the church. Workers smashed the church's glass. At this point, excavators are digging into the church, but we are not allowed to enter or watch. The village head and the police from the local police station warned all the believers against entering the church. Now, we really have no idea what is going to happen." ChinaAid exposes abuses, such as those experienced by Golden Lampstand Church, in order to call out China's abuses of Christians and promote religious freedom, human rights, and rule of law.